The monumental building “Astana-Baiterek” is one of the most famous sights of Kazakhstan. The images of this majestic tower can be seen on postcards or paintings; almost no one souvenir can do without the image of Baiterek. 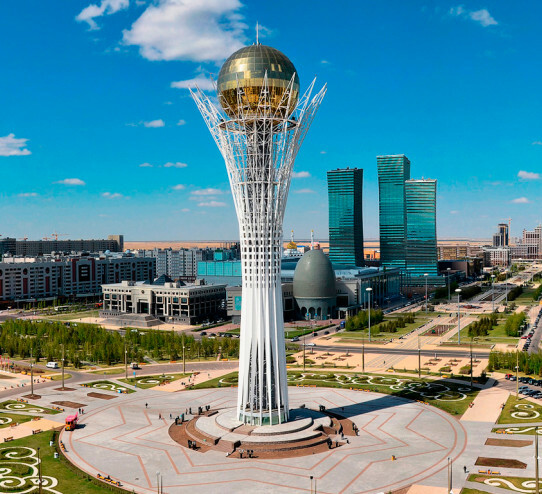 This beautiful and airy structure was erected in 1997, by order of President Nursultan Nazarbayev, wished to create a certain symbol that will represent the new capital of Kazakhstan - Astana. On an openwork construction was placed a ball made of a special type of glass that changes its color during the daylight hours. The diameter of this huge sphere was 22 meters and the weight was 300 tons. It was a unique experience in creating such a construction.Is it possible to imagine that such a huge ball was installed on a construction 97 meters high, after that the total height was 105 meters. The height of 97 meters was not chosen by chance - this was date of transfer of the capital, 1997. As planned by the author of the project - Akmurzy Rustambekov - the name “Baiterek” is translated as the Tree of Life. Truly, a high, slender tower with openwork “branches”, directional upwards and holding easily the golden ball, symbolizing the egg-Sun, brought by the huge sacred bird Samruk. As the day is replaced by night, and summer is winter, that the evil and hungry dragon Idahar, who longs to grab and drag the bright Sun, waits here below. And this reflects the eternal struggle of life and death, bright light and impenetrable darkness, where the World River flows majestically and washes the roots of Baiterek. As in the legend, the tower also consists of three levels - lower, middle and upper. At the lower level are located cafes, small aquariums and mini-galleries. 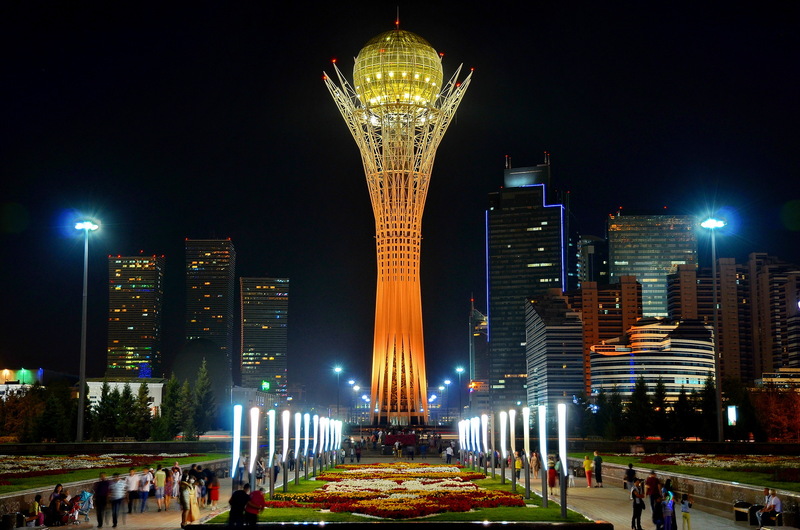 From there tourists can take the elevator inside the ball, from where they can enjoy a magnificent view of the capital of Kazakhstan - Astana. 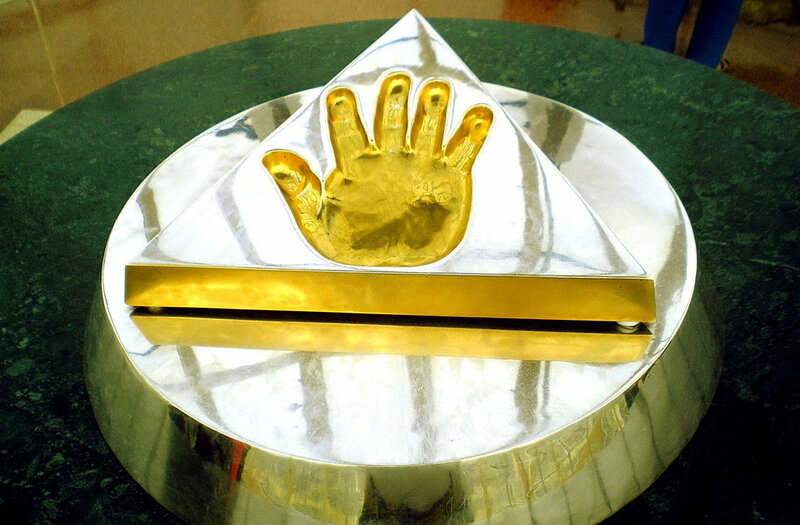 The President of Kazakhstan keep a part of himself in this monument in the form of his right palm's golden imprint. Anyone can touch it, make a wish and it will come true!